***TYPE SELECTION IN ADDITIONAL DETAILS! 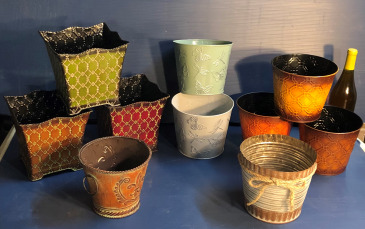 *** Here is our newly refreshed assortment of upgrade containers! They come in many different sizes, so ask us which plants work best in which size. They are all great for unique cut flower designs also! 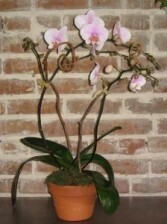 Phalaenopsis are by far the easiest orchids to take care of. Many people believe they are so touchy, however if given medium light (no full sun), a soaking in the sink once every week to 10 days and then just leave them alone, they do beautifully. In our climate here, we are lucky enough to be able to leave our orchids outside, in a nice shady area and they just love it. This beautiful specimen, along with all of our orchids, will reward you with blooms for several months to come. They make such thoughtful and lasting gifts. 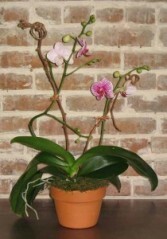 There are several different ways that a Phalaenopsis sends out buds, sometimes they send out two or more flower spikes, or as in this one, they send out side, or lateral shoots. 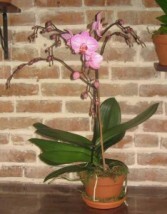 Sometimes we're lucky to recieve orchids with both multiple spikes and laterals, these are truly showpieces!